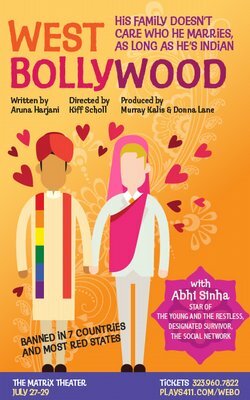 No wonder Indonesian and ethnic Indian playwright, Aruna Harjani, chose West Hollywood for the World Premiere. This comedy has everything to get it banned in 7 countries and most Red States. Lesbians, Gays, Immigrants, Infidelity and Feminism, all wrapped up in a Cinderella story with plenty of Bollywood dancing. Nothing is left sacred except your right to cry, cheer, and laugh all the way to the samosa stand. It all starts when favorite and only son, Pratap (Abhi Sinha, star of The Young and the Restless, Designated Survivor, and The Social Network) proposes marriage to his American flame, Daniel (Derek DeVault), and brings his beloved home to meet the Old Country immigrant family: bossy Grandmother (K.T. Thangavelu), closeted Grandfather (Koushik), Pratap’s repressed father, Lachu (Sameer Khan), and arranged marriage mother, Leela (Abbe Rowlins). Things don’t get any better when Daniel’s Type-A father, James (Paul Nieman), tipsy mother, Olivia (Juli Cuccia), and lesbian sister, Jamie (Cara Delaporta), are told they are on the hook for the dowry. But the grandparents approve as long as Daniel becomes a traditional Indian wife. Of course, it isn’t too long before Daniel turns all that tradition upside down, and even infidelity and a new baby cannot derail the hilarious results.